With a quick and beautiful exit from Santiago, much more pleasant than the entry from Monte do Gozo, this modern stage begins, on which, walkers will only face one steep slope. On a journey through numerous rural hamlets and in general, on good terrain, pilgrims reach, in approximately four hours Negreira, a location that is becoming increasingly better adapted and focused to the needs of pilgrims. Just before, in Ponte Maceira, the main monumental milestone of the day is situated, the stunning Roman bridge over the river Tambre. Travellers should take extra provisions before the exit because for the first 8 kilometres there are no services. The successive pine and eucalyptus tree forests encountered along the route provide comforting areas of shade. From the Carballeira (oakwood) of San Lorenzo, still in Santiago, there are frequent signposts for the route. The custom of leaving a stone on the milestones has become a classic tradition of this Camino. From Obradoiro square, the main goal for other Jacobean routes, walkers wanting to continue the Camino to Finisterre or Muxía should go to the Hostel dos Reis Católicos and begin the journey, on a descent, through the street of Rúa das Hortas which, opens between this former Royal hospital and the Manor house of Pazo de Raxoi, the main office for the council of Compostela. After crossing the street of rúa Galeras pilgrims will head towards the streets of Poza do bar and San Lorenzo. After advancing some meters they arrive at Carballeira (the Oakwood) of the same name, where they will find the first sign and, the first milestone of this Camino. Walkers then reach Sarela de Abaixo, turn right at the milestone 86,722 and later turn left. After more than one kilometre downhill, at the milestone 85,386, hikers will have to turn left and at a junction continue straight ahead. Following a right turn and among some small detached houses they will arrive in Carballal to afterwards climb mount Vilariño, Quintáns is reached shortly after and the first establishment of the day with services, namely the bar Arcos which serves breakfast, snacks and tapas. Towards the peak of do Vento The route crosses the river Roxos and later arrives at two outdoor picnic tables, but without seats. Hikers then climb the peak of Vento and arrive in Ames, the place known as Ventosa (windy). Here walkers will find the second establishment with services. The grill-café-bar Alto do Vento, with a pilgrim menu priced at 8 euros. Hikers continue along the AC-453 and take a turn off that will guide them to a nearby and comforting park with benches and a fountain. After passing the repair garage (J Bello), which, may serve of use to a cyclist with bike problems the route to Finisterre is continued. After passing Lombao, walkers leave, on the left hand side, a turn off to Bertamiráns and, on the right, the path that leads to the albergue of Riamonte. The Way continues ahead and skirts around the turn off to Castelo. On the left hand side there is another garage (Enrique Castiñeiras: (+34) 981890276 / (+34) 669799706) where cyclists can go in the case of any small emergency. On this straight road Pedras is reached, an enclave where the restaurant Casa da Aboa, with a pilgrim menu of the day priced at 8 euros, is situated. (500 meters from the Camino on the right hand side) Pilgrims then bid farewell to the straight road that runs through Aguapesada, but not before passing the bar O Cruceiro and a chemists that opens from Monday to Friday between 09:00 hours until 21:30 hours and, on Saturdays from 10:00 until 20:00 hours. Difficult slope to the peak of Mar de Ovellas Pilgrims are about to begin the most difficult climb of the day. Cyclists are therefore recommended to continue the journey by road, especially during winter given that this Camino can become very muddy especially after periods of heavy rain. On the descent the Camino passes by Carballo, Trasmonte, where walkers will find a good bar and stopping place for breakfast or sandwiches served in generous portions and at reasonable prices. 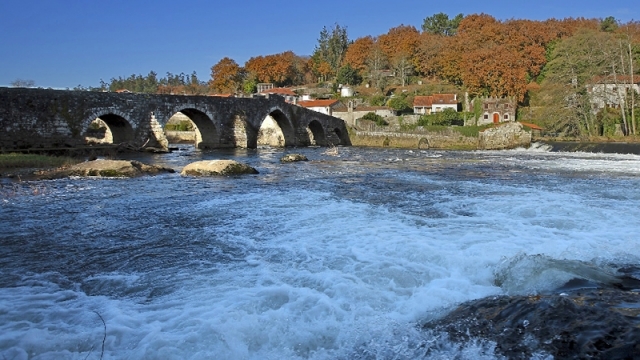 The route continues ahead on asphalt, surrounded on occasions by chestnut trees, through royal places, where, on deviating 80 meters from the itinerary, walkers will also find the meson O Pazo (with a pilgrim menu) and, Burgueiros, to continue the descent to the idyllic natural place of Ponte Maceira. Monumental Roman bridge of Maceira Walkers leave on the right hand side the restaurant Ponte Maceira, located on a former mill. Immediately after, the route passes in front of the chapel of San Brais and heads in the direction of A Barcala, where the rural house of Casa Gasamáns is situated, which, offers free transport to walkers and is situated two kilometres from Ponte Maceira. 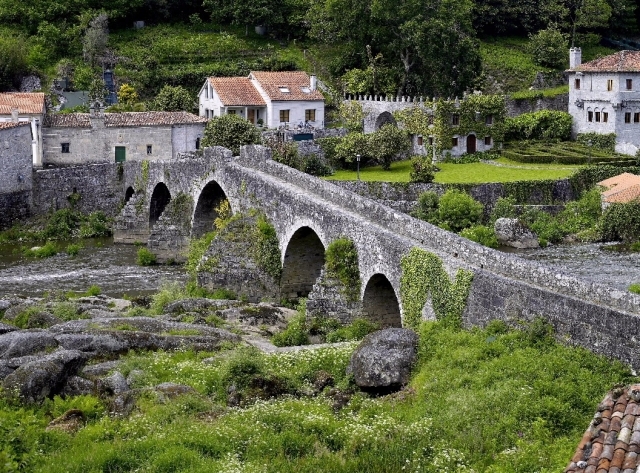 A little later, in Outeiros, walkers reach the Manor house of Pazo de Chancela and a few meters later they deviate towards the hamlet of Logrosa, a place with a fort and a private albergue for pilgrims. The ancient route, however, continues ahead until arriving, after a descent, on the street Avenida de Santiago de Negreira, where the majority of services and accommodation for walkers can be found. Those planning to stay at the public albergue should continue a little further as this establishment is situated at the exit of the location. This stage does not pose many problems for cyclist. However, in winter or after periods of heavy rain cyclists are recommended to avoid the climb to Alto do Mar de Ovellas and instead suggestions are to continue the route by road and avoid the possibility of very muddy tracks. Along this journey cyclists will pass two repair garages that may be of assistance in the case of any minor bike problems. Que "bien puesto" está el Rio Tambre en Ponte Maceira, sobre todo, en Julio de 2016 con la ola de calor en pleno apogeo !!! Todo un lujazo poderse tirar a él,.. faltó tiempo para quitarse la mochila e ir de cabeza. 1 reviews Distance to Santiago: 21 km.